One of the biggest things I’ve learnt since becoming a blogger and starting my own business is that success (or opportunities for success) don’t usually just land at your feet. At the risk of sounding like a Pinterest quote board (mine here haha), if you want something, you have to go out and get it. That means working out what you want (say, a sponsor for a certain blog post, or *that* job), tracking down the right person (ask people you know, stalk them on linkedin etc) and writing to them with your idea. If your email nails it, chances are you’ve got your foot in the door and anything is possible. But because most of us get hundreds of emails a day, there’s more and more competition for people’s precious reply time. So your email has to be good, or at least not bad! You might think it’s not a big deal but more than ever now, first impressions aren’t sculpted in person during an introduction by a colleague or friend, but via email. And often it’s a cold call email! It’s a (perhaps sad) fact that your approach will tell the receiver a lot about you, and may cause them to make a snap judgement, whether it be good or bad. Over the last few years I’ve tried to fine tune my approach to emails, because as a blogger working with brands outside of the city I live in, so much of my work comes through reaching out with what I hope is a good email. Read on for a few things I’ve learnt. Ever opened up an email and had about 2000 words staring at you? Your heart sinks and the sender has pretty much lost you straight away. As Ben likes to say – if you can’t say explain it in 25 words or less you don’t understand it. 25 words might be a bit extreme, but the sentiment itself is somewhat true. Instead of a loonnnng email, send one that is short with links to relevant things you want to reference (to link, highlight the word and right click, ‘hyperlink’ option should appear). What you want to do is spark someone’s interest with a simple and yet thought provoking email, and then follow up with alllll the details once they’ve emailed you back. Use their name and get it right. With a name like Geneva Vanderzeil I’m used to getting all sorts of spellings, pronunciations and abbreviations. Because of this I’m pretty relaxed about what people call me to my face (answers to ‘Genevra’, Genevieve, Jen etc etc etc). 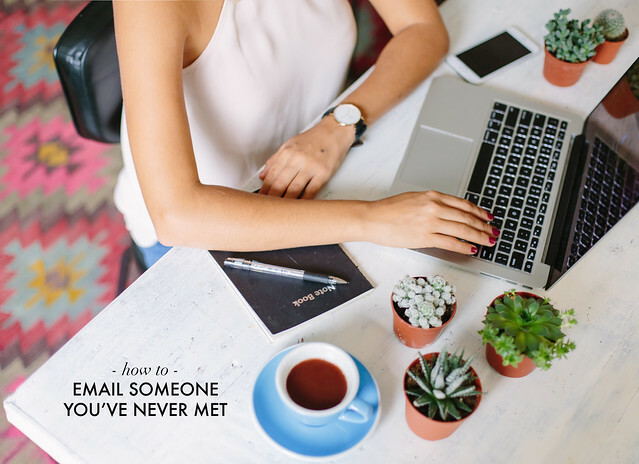 However, when it comes to email and you’re sifting through 50 new ones and someone either gets your name slightly wrong, OR completely wrong – the name issue can be a deal breaker. For that reason you need to watch out for any spelling mistakes, or, in the case of sending lots of emails at once, make sure you don’t send an email to the wrong person. And it goes without saying that you need to read the email twice over in your head (or out loud) before sending to check for errors! Make sure to work out exactly who the person is that you’re contacting. Hopefully you have a direct name or company in which case do a google search and take a few notes – where are they located? What exactly do they do? do they have a website themselves? If this info is hard to track down just make sure you don’t say anything in your email with assumptions, for example – ‘I hope you’re enjoying this sunny Sydney weather we’re having!’ – only to find out they live in San Francisco or something. The trouble with email is that it’s easy to feel like there’s a robot on the other end, and therefore you don’t really think you have to reply at all. In fact, it’s so often easy to not reply. The best way to grab people’s attention is to make a personal connection, without being weird or oversharing. One way to do this is to look at their social networks or do some research and reach out in a way that’s understandable. One example could be: ‘I saw you were recently in Tuscany and thought your photos were lovely – I went a few years ago and loved Florence, I can’t wait to go back‘. Also, it helps to ask a question at this point, perhaps asking for their view or judgement, in the hope that will encourage them to reply. I am the worst when it comes to these, and often have to go through and delete swathes of exclamation marks. What can I say? I’m excited! ABOUT EVERYTHING! However, the person on the other end of the email may feel yelled at or overwhelmed by you (and thus: next), so keep calm and delete those pesky dudes. ok?!?!?! Fact: Everyone deserves to feel good about themselves. The same goes for in email, be kind and genuine and tell people honestly how much you appreciate what they do. This can brighten someone’s day and chances are they’ll reply to you. It’s not unusual to not get a reply the first time, people are busy and it’s not surprising that they don’t prioritise some random person emailing them. A quick follow up after the first email (kind, polite: just thought I would touch base with you because I’m know you must be very busy etc) with the original email below will often help to get a response. Don’t be scared to set up a phone call or meet up once you make contact, it’s amazing how much of a difference putting a voice (or a face) to a name can be for furthering your relationship. Do you have any other tips for getting emails right?